UPDATE!! 2014 This pattern has been retired and will no longer receive pattern support . This pattern can still be used and finished items sold, however, the pattern remains protected under copyright as stated below. Copyright 2011 Author: Sharon Ojala - Amigurumi To Go, All rights reserved Attention members of all cross stitch and DIY sites Text and images contained inside this pattern are not authorized to be sold as a cross stitch pattern nor shared in full or in part on any cross stitch site nor on any DIY site nor on any website. This does not exclude sites or members of sites posting copyrighted material under the guise of educational purposes. Special notes: This pattern is now retired and no longer will receive any pattern support if it's needed. Please use the revised pattern. 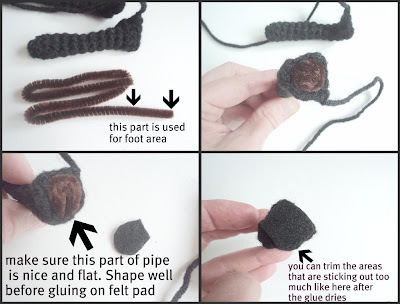 Sew the 2 pieces together, starting from the mouth area and work up. Leaving an opening on the top of the head for stuffing. You want to stuff from the top down towards the mouth. Close up once you have the stuffing in and the shape you want. Take a look at pictures of the cat to stuff and shape accordingly. Lay the nose over the face, it will not fit length ways but the top part will fit end to end across the top of the head. Pin in place at the top and sew across the top starting at one end and work toward the center, leave an opening for stuffing, now start at the other end and towards the center. You want to stuff from the top downwards as you did for the head so leave an opening. Once the top is sewn in place start sewing around the nose pulling the nose downwards a bit (not too much) and make sure you keep the nose centered as you pull and sew. Stuff and shape and then close up that opening at the top. The eyes I cut from light blue felt. The shape is very important to get that creepy look. I cut 4 pieces, glued 2 together to give the eye some depth and then glued onto face. 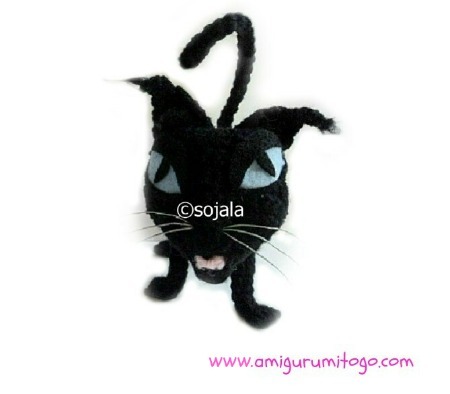 Cut an eyelid from black felt and carefully glue that over top of eye, same goes for the pupil. I also cut a length of black yarn and very carefully glued that under the eye to finish the eye off nicely! The nose I made by stitching in pink yarn. Whiskers are important too for the overall look of the cat, I used thin wire and pushed each one through the nose. *** before the hole gets too small you need to stuff the body. I recommend that you stuff the body with pellets or grains of rice. This will keep the cat from flopping over when you stand it up, the head sits away from the body which makes it top heavy. I took some light fabric and stuffed it in the body making sure to line the entire body completely so nothing could escape then filled it with grains of rice. I then dropped in some hot glue and folded the fabric over to seal it up like a pouch. Take a pipe cleaner and fold it over a couple times and trim excess. You want the pipe a bit longer then the neck itself. Glue a small piece of felt to each end of the pipe cleaner, push it into the neck and now you can sew it to the back of the head. 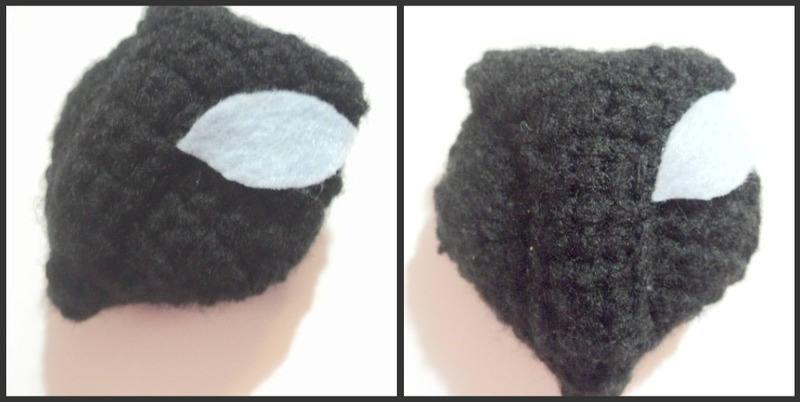 The felt pieces will keep the pipe cleaner from working any holes inside the cat. finish off. Sew on head. Look at pictures first and determine how you want the ears to sit on the head. Sew on accordingly. I tied a bit of yarn to each end of ear and frayed the ends to give it a ratty sorta look. Shape the body a bit more with your fingers. Work that stuffing around in there until you are happy with the shape. Pin the legs on as pictured and sew on. You want to sew on with the same yarn you have been working with. 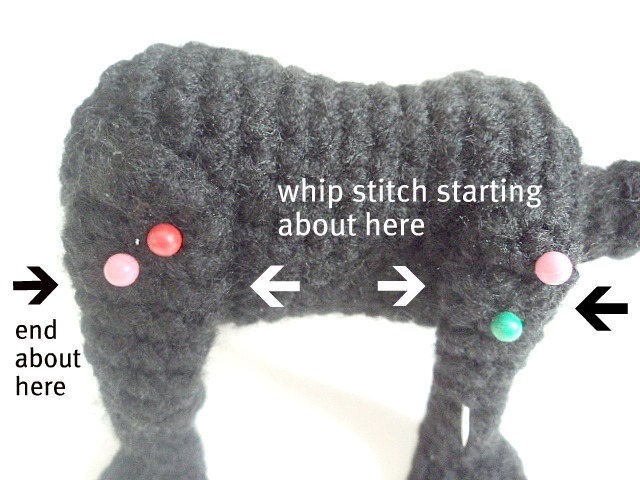 Whip stitch them to make the legs "one" with the body. Love this cat pattern, thanks for sharing!!! I hope I can make it soon! Thanks for sharing! I have video tutorials posted for this cat on youtube, called "The Ghost of Wuss Puss". You can find the links on the right side of this page under the heading "My Youtube Tutorials"
Thankyou Sharon, worked fine, just have to refer to the website for pictures, or tutorial . Great Suzanne! And I got your wonderful email as well... many blessings to you and your family. Would it be possible to have directions sent to me that I could print? I love this pattern and the Coraline pattern, too. I love them all!!!! You are so creative and they are precious. Oh my goodness! My Coraline obsessed sister will just freak for this! 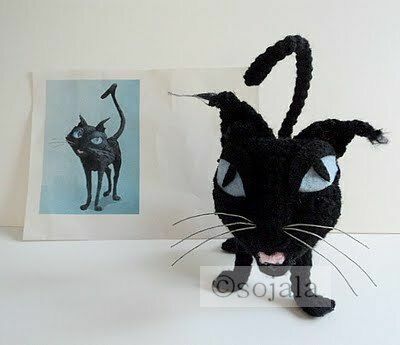 I want to make this cat but also the Coraline that is in the picture with him. Do you have the pattern for her on your blog? I'd really appreciate it. Thank you! I'm so silly. Right after I posted my first comment, I did a simple search on your blog and boom! There was the pattern for Coraline. Thanks for such awesome patterns!! Thank you so much Evden! Sorry to hear of the hair troubles. The video didn't help? so I really like this pattern over the new and improved but on the tail it looks like you go from 6 to 4 with only 1 decrease which would make it 5 around ... I was wondering if its 5 around or 2 decreases? What an awesome project. I've almost finished the cat and deciding what character to do next. Your pattern is easy to follow and the video has answered any question I had. Bravo on your great work! By far the most well put together instructional pattern I've come across. Keep up the good work! Gracias por compartir, eres fabulosa.